I used a set of five 2.75 mm sock needles (Knit Picks Harmony) for a gauge of 6.5 stitches per inch in Dream in Color Gaia, color called Lipstick Lava. I had beginners luck with the first short-row heel. The heel on the second sock was more lumpy and full of holes than the first; even the grafted toe did not come out as well. The socks are still ok though. Even though they're wool I wore them on an outing to the Fernwood Botanic Garden in Buchanan, Michigan where I saw this (below). Look closely in the center of the photo and you'll see what I saw. 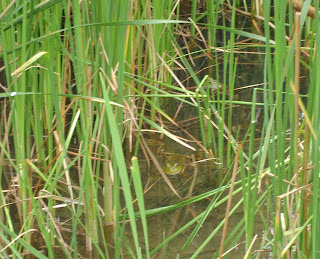 I am rarely lucky enough to see reptiles or amphibians in nature. The socks kept my feet comfortable and must have brought me luck. 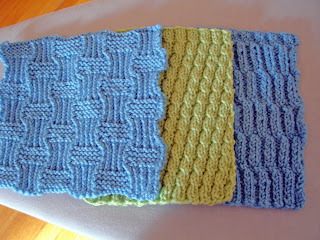 I also worked on my endless skirt (first photo), making some progress, and I made 3 more Learn to Knit Afghan squares. I realized that the dark blue yarn I originally planned to use, because I already owned it, won't work because it makes squares the wrong size. So I had to buy some more Cascade 220 superwash in dark blue to make the squares a consistent size. Now my whole project has cost a large fortune rather than a small one as I had expected. That bottom square is sort of ugly, but I made a rule that I have to use all the squares, so I will. We had perfect weather. Happy Bastille Day! Looks like a great vacation!! Can't wait to hear about it! Btw, none of those squares were ugly.